Are you filled with that warm and fuzzy holiday spirit? Real talk time. November through December can be a lot, between end of the year work, shopping and social events. Add to that the constant pressure to be in a chipper holiday spirit when all you really want to do is curl up on the sofa to watch The Christmas Prince for the 54th time. Perhaps unsurprisingly, the thing that gets me into the holiday spirit is food (and reading the annual Hater's Guide to the Williams Sonoma Catalogue). Latkes with sour cream and smoked salmon. My dad's rosemary and garlic roasted potatoes which I can never seem to replicate even though it's just potatoes and garlic and rosemary and olive oil. Cinnamon rolls with a doughy center. Starbucks peppermint mochas (the rest of the drinks on their holiday menu are blasphemy). Eggnog sans rum because milky alcohol is gross. And cheesy breakfast casserole washed down with champagne before opening gifts. If you need another reason to hop on the intuitive eating train, how about the fact that when you're not stressing about food, you can actually partake in, and enjoy your family food traditions. Sharing food is one of the ways we connect with family and friends and and celebrate our culture as well. Because who has ever had a memorable family meal over baked chicken and steamed broccoli? I'm a big believer that embracing food traditions, no matter how much butter and cheese is involved, makes us happier and healthier. That's one of the reasons why I love my dear friend Meme's new cookbook, Generations of Love and Food, so, so much. For as long as I've known her, she's talked about wanting to write a cookbook with her grandma Nan, and it's finally come to fruition. 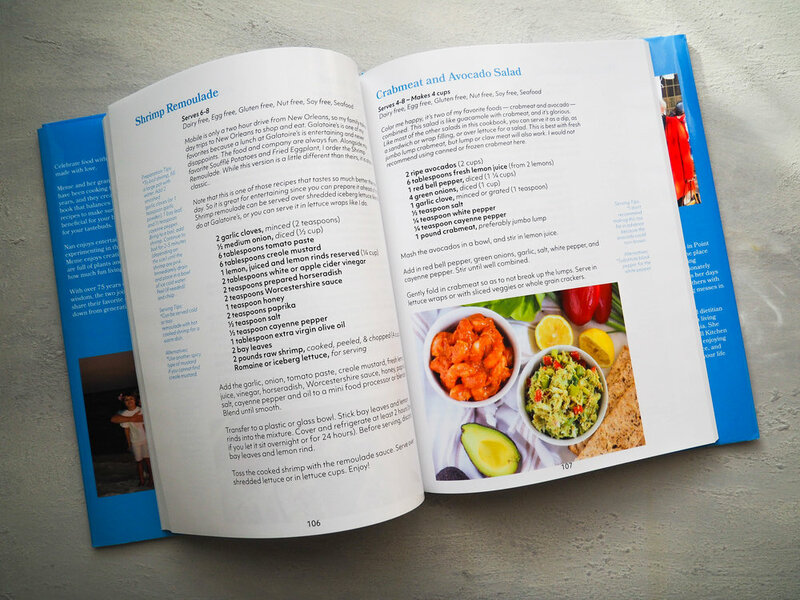 Meme is a fellow non-diet dietitian and food blogger at Living Well Kitchen, and it was Nan who first taught her to cook as a child, and instilled a love of food and an appreciation for how it brings people together. Living on the Alabama coast, her kitchen was always churning out classic Southern dishes for family, friends, and social events. Nan is the hostess with the mostess. 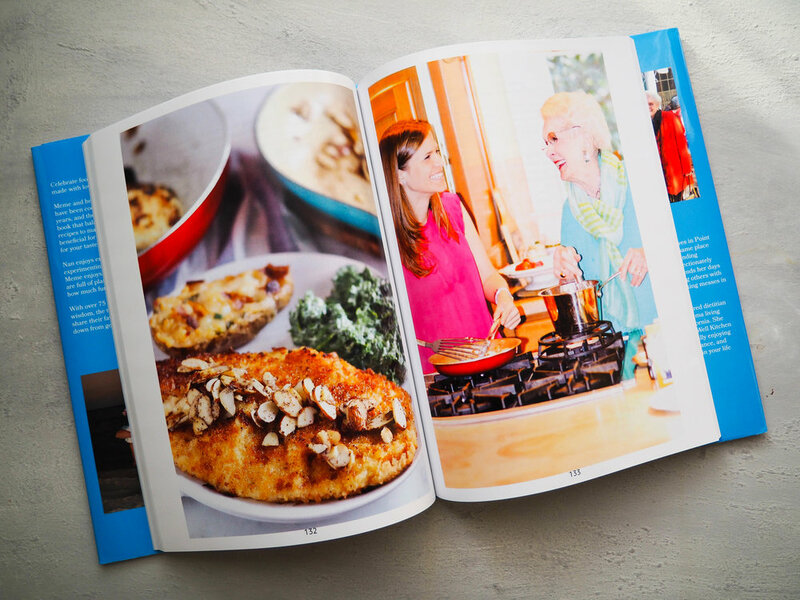 In Meme's cookbook, she's collected all those family favorite recipes, plus some of her favorites from the blog, and brought them together in a cookbook that makes entertaining and family meals easy. One of my favorite things about Meme's website is that her recipes are simple, approachable, and always turn out perfectly. With her cookbook she makes entertaining fuss-free by focusing on food and family, not going overboard to impress with difficult recipes, or taking all the cheese and butter out of traditional recipes so all that's left is cardboard and dried beans. 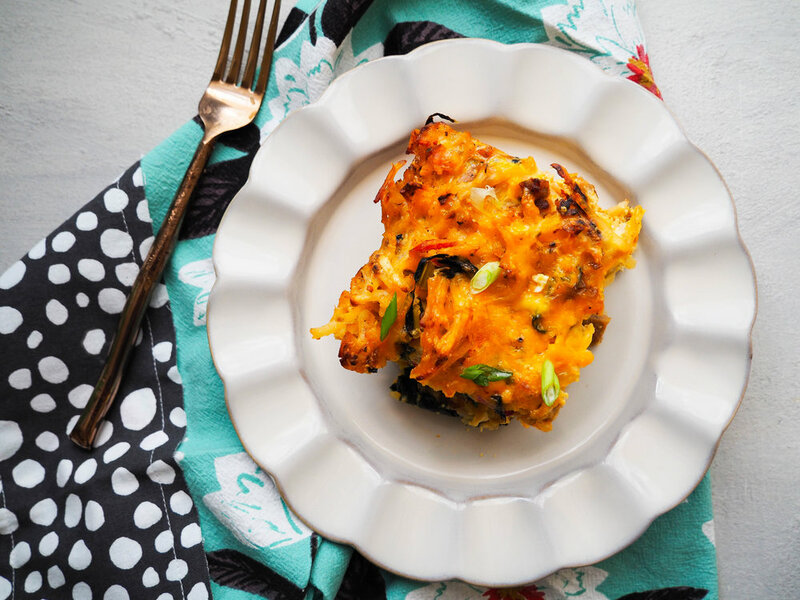 The hash brown breakfast casserole I'm sharing today is a perfect example of how she approaches recipes! It keeps the cheese and sausage, but throws in extra vegetables for taste and nutrition, and makes it special with the most addictive spice blend with paprika, thyme, cayenne, ginger, turmeric and nutmeg. Thumbing through the recipes in her book, it kind of reminds me of a more modern day Charleston Receipts (the famous Junior League cookbook). Some of the recipes I can't wait to try - summer squash and leek soup, broiled parmesan tomatoes, breakfast turkey hash, and lemon garlic baked shrimp. It's also going to become my new go-to tailgating book with all the yummy appetizer recipes like pickled okra rollups, slow cooker jalapeno garlic boiled peanuts, and shrimp salsa. 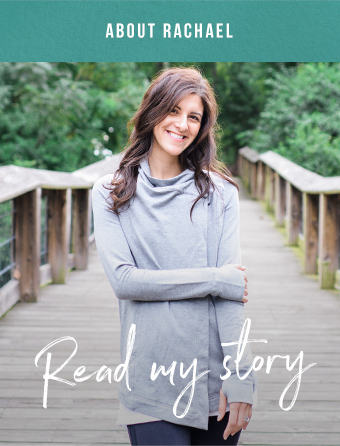 I'm sad that I didn't get my act together in time to share this post so you could order her cookbook before Christmas! 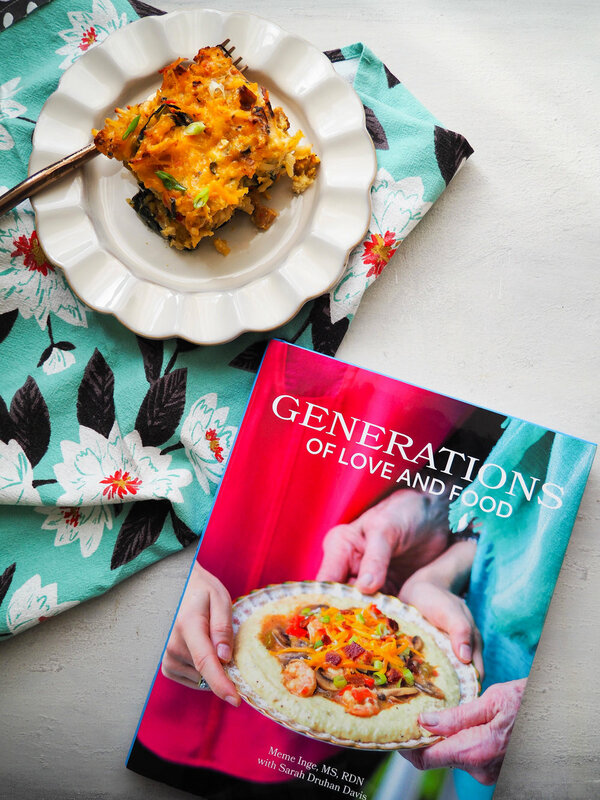 But if you're looking for Southern-inspired cookbook packed with wholesome, family friendly recipes, treat yo' self to her Generations of Love and Food. Living in SC, I know I have a ton of clients who grew up on classic Southern food, and want those same tastes, but without spending hours in the kitchen, and with fresher, more modern ingredients (aka not condensed soup). Hash brown casserole is almost always at our Christmas breakfast, so I thought I would share Meme's version. Feel free to use other veggies you have on hand, like cauliflower, spinach, tomatoes or squash. I added kale because I had a bunch on hand that was starting to look a little wilty. I also just realized the kale and peppers make it red and green so it's REALLY perfect for Christmas! But it's also easy enough to whip up for a make ahead breakfast during the week. If you'd like to order Meme's book as a New Years gift to you, here's a link! Heat 1 tablespoon olive oil in a large skillet on medium-high heat. Add shredded hash browns and cook in one layer, undisturbed, for 10 minutes. Stir and cook for another 5 minutes. Transfer to a large (9 X 13 inch) casserole dish. Add salt, paprika, garlic powder, thyme, red pepper flakes, cayenne, ginger, turmeric and nutmeg to the sausage-vegetable mixture, stir, and cook for 5 minutes. Transfer to the casserole dish with the potatoes. Add 1 cup cheese, stir everything together and spread into an even layer. In a medium bowl, whisk together the eggs and milk. Pour over the casserole. Cover the dish with foil and bake in the oven for 45-50 minutes until the casserole is set. Carefully remove from oven, sprinkle the top with remaining 1/2 cup cheese. Turn the oven to broil and broil until cheese is melted and slightly browned, about 5 minutes.